Consumers have grown used to the ability to order food at the push of a button and have it delivered to their doorstep within the hour. Will they be interested in using technology to grow it themselves at home, especially if it means more work and waiting several weeks to eat the food (which is presumably fresher and healthier)? It’s a niche product that will have to overcome some hurdles, including enticing people to shell out $2,700 or more for it—and to have patience. Blanchet and Jamie Byron founded the company in 2013 while they were students at MIT. They have since raised more than $4 million from Upfront Ventures, Vayner/RSE, and others, and hired around 20 people. The startup is housed in the Greentown Labs incubator in Somerville, MA. Grove has fine-tuned the product using feedback over the past six months from 50 pilot testers in the Boston area. Now, the company is going national with the Kickstarter campaign and is organizing demonstration events in six cities around the country, Blanchet says. 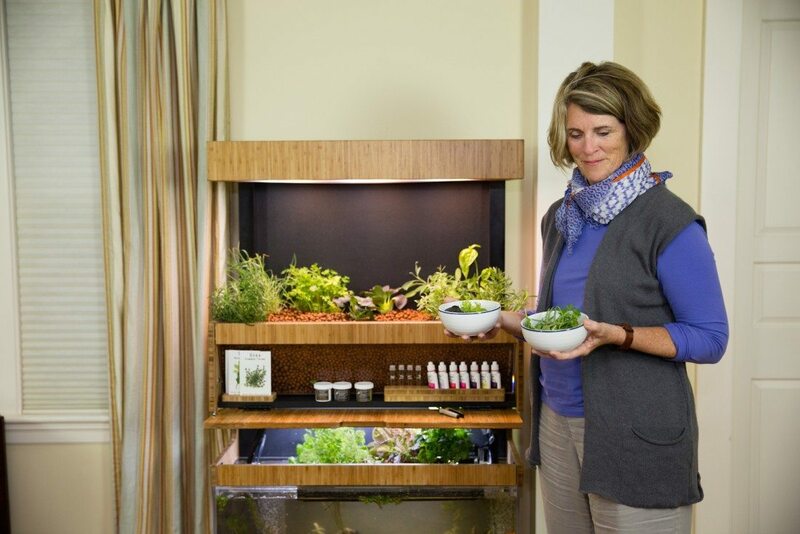 Grove’s system combines a couple of gardening beds, an aquarium, and space for working with the plants and storing tools. The food is grown using aquaponics and a symbiotic natural process in which the plants feed off of the nutrients in fish waste and simultaneously clean the fish tank. The plants grow under LED light and in nutrient-filled water, rather than soil. Grove says its system can grow food faster and in closer quarters than typical outdoor gardens. Like most startups these days, Grove’s product has a software component. The company created a mobile app that syncs with the system’s sensors to remotely monitor and control the Grove Ecosystem (think watering, light intensity, air flow, and system status updates). The app also allows Grove customers to order curated seeds and supplies, read growing tips, and connect with other indoor gardeners. Grove and its competitors—including SproutsIO, which is based in Detroit and Boston—see an opportunity to capitalize on the locally grown food movement, and to increase access to healthy food in urban areas that lack grocery stores. The question is whether urban and indoor farming can move past the hype and niche stage. In our interview, Blanchet aims high while also tempering expectations. He talks about “democratizing and bringing awareness and inspiration of a new way of growing food,” but recognizes that Grove is only one player in those efforts—and that indoor farming by itself can’t solve the world’s food challenges. “But the same technologies, mindset, and culture can lead to the real solution, which is a distributed system with lots of different ways of growing food,” he says. Blanchet has enjoyed seeing the ways that early users are experimenting with their “groves,” including growing wheat and other grains; herbs like cilantro and oregano; and ingredients for teas and herbal remedies. “Some people are using it as a living medicine cabinet,” Blanchet says. He’s not surprised by the creativity that follows when “you open up gardening to hackers and tinkerers and urban folks who might not have a garden all year-round,” he says. The question now is whether Grove can attract a mass audience. The system is expected to sell for $4,000 to $4,500 apiece, but Kickstarter backers can preorder it starting at $2,700. The plan is to start shipping the first units in March, Blanchet says. Blanchet expects the price to come down as the technology advances. He equates it to early personal computers—expensive, niche products that over time became cheaper and pervasive. It’s unclear how quickly Grove will be able to lower the price and attract a larger number of customers. The success of the Kickstarter campaign could have a big impact on the company’s trajectory. “But we’re patient, and so are our investors,” Blanchet says.